MIAMI (AP) — The last spot in the NBA playoffs went to the Detroit Pistons. Their reward: A series against MVP candidate Giannis Antetokounmpo and the Milwaukee Bucks. The drama of the regular season went all the way to the very end of the regular season, with seven of the eight first-round playoff matchups not being clinched until the final night was in the books — the last three of them, out West, going down to literally the final moments. The two-time defending champion Golden State Warriors will start their quest for a fourth title in five years against the Los Angeles Clippers. 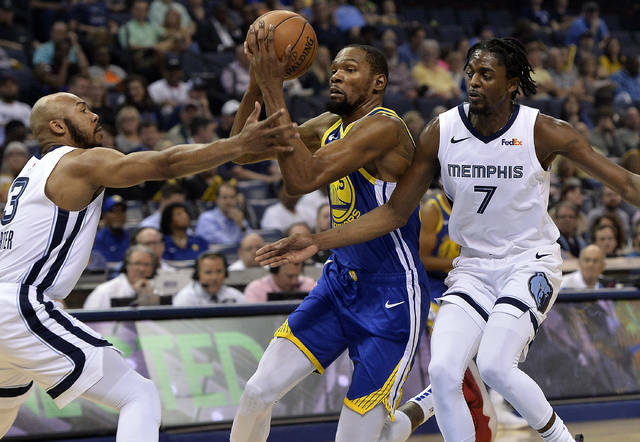 “It’s not going to be as easy as people think it is,” Warriors star Kevin Durant said. That’s the beauty of the playoffs. It’s not supposed to be easy. First-round games in all eight series will be played starting Saturday and Sunday. The second round cannot begin until April 27 at the earliest, the conference finals couldn’t start before May 12 and the NBA Finals will start on May 30. The only matchup in the NBA that was set before Wednesday night was No. 4 Boston against No. 5 Indiana. Everything else, just like all the West matchups, fell into place during Game 82s on Wednesday. The Bucks, the NBA’s top overall seed, play the Pistons. No. 2 Toronto draws No. 7 Orlando, with the Magic in the postseason for the first time since 2012. And No. 3 Philadelphia — a team wrapped in intrigue right now — will face No. 6 Brooklyn. Joel Embiid played in only 10 of the 76ers’ 24 games since the All-Star break, and general manager Elton Brand told reporters Wednesday that “it is possible” the team’s best scorer and rebounder won’t be ready to start the playoffs. Embiid isn’t the only injury situation that made headlines Wednesday: The Celtics announced that Marcus Smart will miss four to six weeks with an injury to his left oblique — a massive blow to Boston. Portland rallied from 28 points down on Wednesday against Sacramento — which blew a lead that large for the second time this season. Denver finished on a 15-0 run to beat Minnesota. And with that, the West bracket was shaken up one last time before it was finally set. Top-seeded Golden State will face the eighth-seeded Clippers, a matchup that was known after early results Wednesday. The rest went right down to the wire, with No. 2 Denver facing No. 7 San Antonio, No. 3 Portland getting No. 6 Oklahoma City and No. 4 Houston facing No. 5 Utah. It was a worst-case for Houston, which entered the season’s final night in place to finish second, third or fourth in the West. The way the results fell means the Rockets, if they get past the Jazz, would likely see the Warriors in the second round — and not in the Western Conference finals. So there will be no rematch of last year’s title series out West, a tussle where the Rockets had a 3-2 series lead before Chris Paul’s hamstring balked and the Warriors went on to advance and reach the NBA Finals. 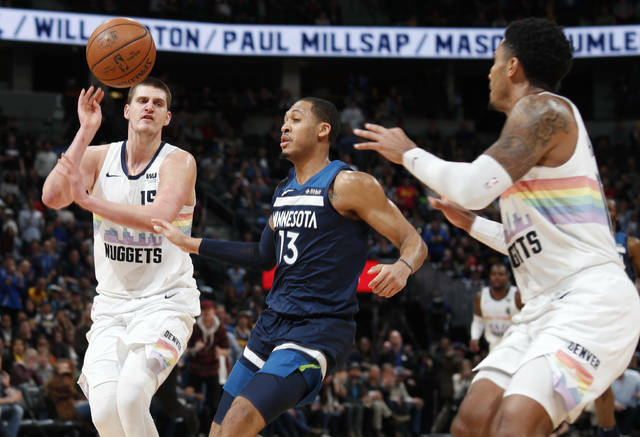 The Nuggets clinched the No. 2 seed with their big rally to top the Timberwolves. The Blazers got to the No. 3 spot with their wild comeback to beat the Kings. The combination of those results dropped Houston to the No. 4 seed. Brooklyn at Philadelphia, 2:30 p.m.
Orlando at Toronto, 5 p.m.
L.A. Clippers at Golden State, 8 p.m.
San Antonio at Denver, 10:30 p.m.
Indiana at Boston, 1 p.m.
Oklahoma City at Portland, 3:30 p.m.
Detroit at Milwaukee, 7 p.m.
Utah at Houston, 9:30 p.m.
NBA teams averaged 111.2 points this season, the 11th-highest mark in league history. It’s also the highest scoring clip in the league since 1970-71. Records were set for 3-pointers made and attempted for the seventh straight season, along with total points for the fifth time in the last six years. NBA teams scored 273,573 points this season, fueled by new rules that allowed offenses more freedom of movement, a league-wide commitment to playing at a faster pace — and the still-growing love affair with the 3-pointer. In the 2012-13 season, NBA teams averaged 20 attempts from 3-point range — which was a record at that time. This season, they averaged 32 attempted 3s per game. A pair of legends played for the final time Wednesday night — and went out in style. 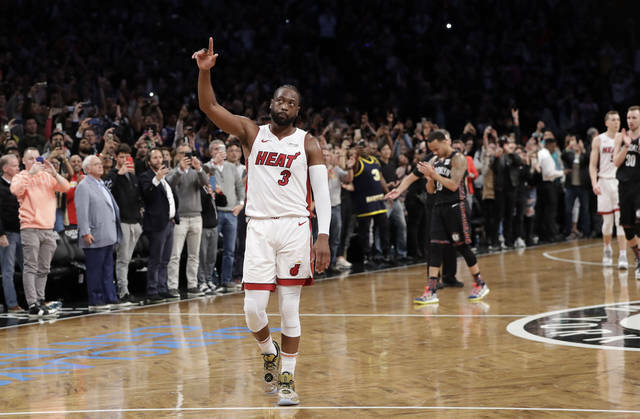 Dwyane Wade had a triple-double for Miami at Brooklyn, 25 points, 11 rebounds and 10 assists. Dirk Nowitzki had 20 points and 10 rebounds for Dallas at San Antonio. The Heat and Mavericks both lost, which was irrelevant to both clubs. The nights were about Wade and Nowitzki, both All-Stars this season.